I’m embarrassed to say that this was my first viewing of the Godfather. Yes, I know I should’ve watched ut years ago. My dad wasn’t that into gangster movies and I wasn’t begging to watch them, then I just never got around to it. It wasn’t that I didn’t know it was a good movie or that I wasn’t interested, I knew it was going to be a heavy movie and most of the time whenever the opportunity arose I wasn’t in the mood to live through that.I’m sorry. Now that I’ve gotten through that I get to entreat you to the thoughts of a person who has an MFA and just watched the Godfather for the first time. Just like the rest of these movies no one needs me to tell them that the Godfather is an excellent movie. I suppose that what I was the most surprised at was how much I found the movie to be enjoyable. I say that because many (if not most) of the movies on the AFI top 100 are laborious dramas where the plot is secondary to the characters and acting trumps intrigue. 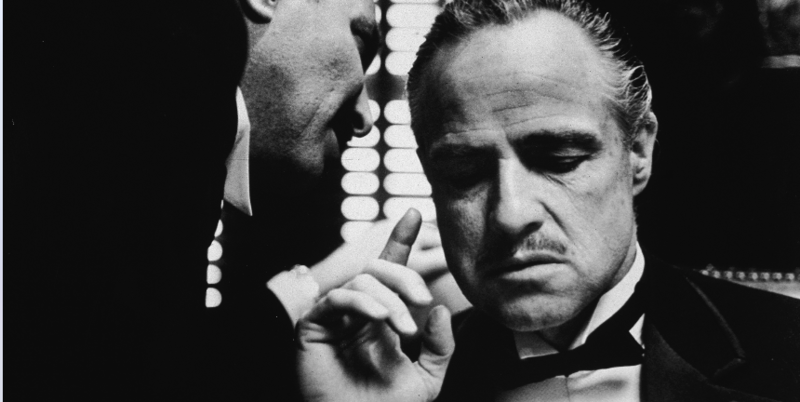 The Godfather has a clear plot that meanders a bit, but doesn’t get lost in the weeds too much. Despite its long runtime it manages to keep interest and made me want to keep watching. I’m also embarrassed to say that aside from the original Superman that this is the first film I’m watched featuring Marlon Brando. I’m eager to get to the others on the list that have in the lead. But I’ll talk about him more when I get to those films. The true feature character of The Godfather is young Al Pacino starts the film trying to deny “the family business.” But ends the film having dawned (pun intended) the title of “Godfather.” It’s the story of generational sin. It speaks to the reality that many people live with; the seeming impossibility of avoiding becoming your father, or at least grappling with his sins. The drama of the movie and the characters are all fantastic, but the thing that makes the movie truly great are the moments of dissonence with that drama. “Leave the Gun, take th cannoli.” being spoken simply after disposing of someone. Or a scene wherein the senior Don plays in the garden with his grandson as if he were a normal grandfather. It’s this combined with the drama, the acting, the dialogue, and the excellent cinematography that make this movie so unusual.